Virtual rendering of the Papio specimen UW 88-886 from Malapa (courtesy F. Bouchet). A high-resolution microtomographic study of the Papio specimen UW 88-886 from the Early Pleistocene site of Malapa, Gauteng, South Africa (Master project at the University of Toulouse Paul Sabatier, France). Published in Palaeontologia Africana (link). 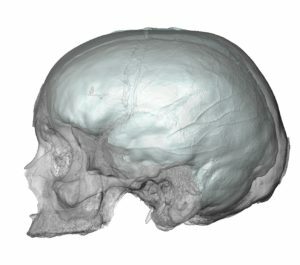 Virtual rendering of a modern human cranium and endocast. Exploring an innovative method for the automatic recognition of cortical sulci in cranial endocasts (Master project at the University of Pretoria, South Africa). Preliminary results presented at the annual meeting of the American Association of Physical Anthropology at Austin (USA) in 2018 (link). Virtual rendering of the hominin specimen StW 669 from Milner Hall. 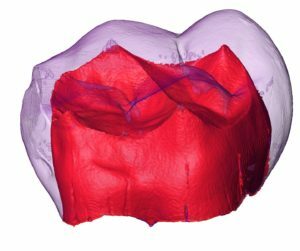 A microtomographic study of the StW 669 hominin molar from the Milner Hall, Sterkfontein Caves, South Africa (Honours project at the University of the Witwatersrand, South Africa). Preliminary results presented at the biannual meeting of the Palaeontological Society of Southern Africa in Bloemfontein (Afrique du Sud) in 2018 (link).